So, I've been doing deeper research into DAW over the past few months, for obvious reasons, and learning more about the other people who write for DAW. It's a pretty good crowd to be associated with, I can tell you that. Good people, good books. I really couldn't hope for better. And as part of that, I checked out Seanan McGuire. Let me tell you something about Seanan: she is a machine. Since her first book with DAW in 2009, she has knocked out a novel every six months with them like clockwork. That's 10 novels in five years, in addition to short stories & novellas galore, AND four novels as Mira Grant. Seriously, that's something to aspire to. I mean, I don't think I'll-- at least at this point-- be able to match in terms of shorter works and works as Mira Grant... but two a year. That's a goal I think I can hold up to. Right now, I have two scheduled for 2015 (Thorn of Dentonhill and Murder of Mages), and I'm nearly done-- about 70%-- with the rough draft of Thorn II, and will get on Murder II right after that. Plus I've got Holver Alley Crew and Way of the Shield in the wings. And that's the point, at least for me: work as a full writing professional. That's a plan that involves volume. Of course, as a planner, I have an outline plan for a full series for Thorn, Murder, Holver Alley and Way of the Shield. And so far, it's working out. But to go back to my point: Seanan is my hero. She clearly is going full throttle and that's exactly the sort of career I hope to emulate. Plus, it's always good to set another bar once you cross one. All right, back to the word mines. So, the other day I was at physical therapy for my broken foot*, and at the next table the patient was trying to explain Game of Thrones to his therapist. And, it was clear listening to them that the therapist just plain didn't understand it, and the guy explaining it also didn't fully understand it. Phrases like "So, it's like Lord of the Rings?" and "So, it's in medieval times?" were often repeated, usually with the tone of voice reserved for discussing unsavory things. I mean, I'm glad that fantasy, as a genre, has become mainstream enough that Lord of the Rings, Harry Potter and Game of Thrones are legitimate pop-culture phenomena. Captain America is the top movie for three weeks running, and if you had told me that twenty years ago, when the best we had done for that character was the Matt Salenger atrocity**, I would have fainted dead away. I think it's important to remember that we're still on the fringes here. Yeah, George RR Martin will now get on legitimate talk shows, but the rest of our rock stars don't get much notice outside of our own circles. Most of what we do and write stays in our circles, and it's easy to get lost in the sense of how big that really is. The things that cause twitter-sphere and blog explosions tend not to make much of a dent beyond the SF/F community. More beyond that, a lot of the things about our genre as a whole don't make of a dent beyond the community itself. Despite it being at an all-time high in popularity, despite it being one of the top selling genres in literature-- it's still on the fringes. Which is fine. I'm comfortable with being on the fringes, being part of this community. But it's good to have these little moments to put the things that seem like a Very Big Deal back in perspective. *- It's pretty much healed and I'm back to normal, thanks for asking. **- I could rant for a while about that movie. One thing I've noticed reading fantasy fiction is the notion of stability: that people or nations stay more or less locked for centuries, if not millennia. This is, of course, patently absurd. You can easily see how borders and nations in Europe were in constant flux. This is not the sort of thing you typically see in fantasy, though part of it is because readers do not need that level of detail. And, of course, how much detail do you, as the writer, really need to work out for the history? The answer remains: as much as you really need. But I think it's important to note the difference between simplicity and stability. It's one thing to not go into the details of how a region has shifted hands and borders of the years. It's another to make those lack of details translate into a lack of change. People don't work that way. The same could be applied to the "lost king" trope. I can't imagine a civilization would run on the premise that their government is permanently in 'regent' mode, on the hope that the person who really is the ruler might show up and claim their right at any time. That the system is designed with this premise in mind. I mean, has that ever actually happened in history? Now, I admit, in the history of Druthal, I do make a little play off the "lost king" trope, in that a group discovers that one of their number is a direct descendent of the first King of Druthal. But they don't use that as proof of divine right, but rather as the spurious grounds to depose a horrible king that they already wanted to depose. * It wasn't destiny, but the sugar they used to coat the bitter pill of revolution they wanted the populace to swallow. So, it might be valuable to check through your worldbuilding and ask yourself: do I simply not go into detail about the past here, or have I built something that is far too static to be realistic? *- Druth history is actually filled with bad kings-- either incompetent or malicious-- and people who plot to get rid of them. This is something I used as a general plot point in Way of the Shield. Yesterday, I was summoned for jury duty. This meant I arrived as required, along with twenty-three other people, sat around for a bit, and then had a clerk, a judge and a prosecuting attorney all tell us what a good and important service we were providing. After a series of asking-the-whole group vague questions from the prosecutor, the jury of six was selected from the twenty-four, and the rest of us went on our way. All this, mind you, for a speeding ticket. Which made the whole exercise a fascinating bit of theatre of the absurd. Because while you have the right to a trial-by-jury even for a speeding ticket, it's a right that most people would never exercise, because-- it's a speeding ticket. Forcing it to go to trial-by-jury is probably a massive waste of time and resources. And yet, we do it. We go through the whole dance for small matters to demonstrate why it's so important for larger ones. To bring that around to worldbuilding-- how the laws and rights your cultures enact, as well as how they are enforced and enshrined, says a lot about how that culture operates. For example, when someone is accused of a crime, is it the burden of the state to prove their guilt, or the burden of the accused to prove their innocence? And what will guilt or innocence mean? In the world of Maradaine, the Kieran Empire is a true plutocracy, to the point where all crimes are punished with a fine. If someone cannot afford their fine, they are sentenced to a slave work camp to earn it off. So the rich can afford to do whatever they want, for all intents. 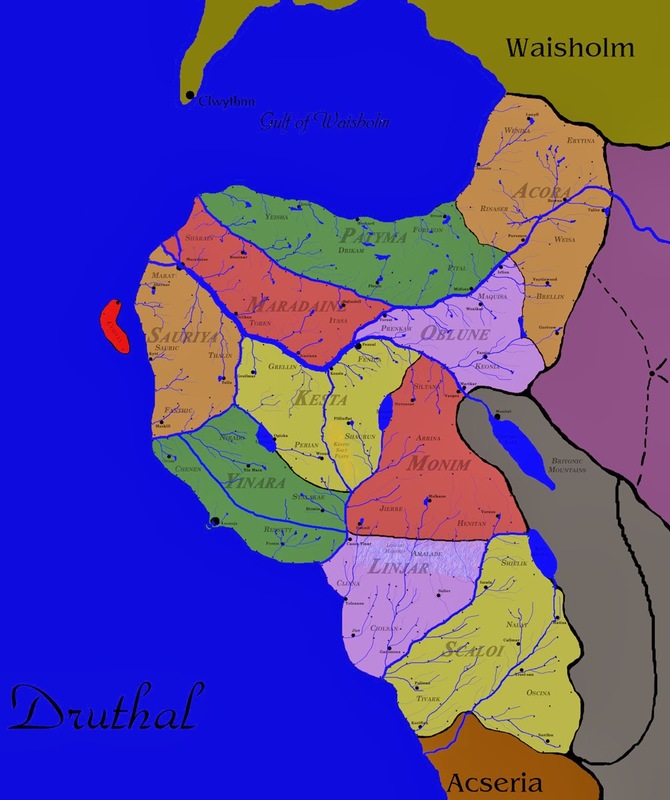 Druthal, and the city of Maradaine, has a system of more complex laws and enshrined rights. Their justice system is very much based on the presumption of innocence and keeping law enforcement in check. This comes as a reaction to the period in their history shortly before a total overhaul and reformation of the government, where agents of law enforcement had nearly unlimited power to arrest and incarcerate at whim. So the "modern" Druthal defined its laws under the premise that preventing those abuses is the paramount concern for continued freedom of the populace. Even their equivalent of the Right to Bear Arms is predicated on the notion that a person has the right to defend themselves if being arrested unjustly. I did all this because, in part, I wanted something different from the top-down of the standard fantasy situation where the king has unchecked power, and being king makes one the absolute authority. I also did it because I wanted A Murder of Mages to be a story in which the constabulary are bound by rules of what they can and cannot do. Without their authority in check, the characters could take whatever action they saw fit, without limitation. That wouldn't be an interesting story. ArmadilloCon is now three months away, so I figured it was high time to turn up the signal on this year's workshop. If you are a genre writer looking to get to the next level in your writing, this is a wonderful workshop. Check it out. Sign up for the ArmadilloCon 34 Writers' Workshop and receive invaluable feedback on your unpublished Sci-fi, Fantasy or Horror story from two SF/F professionals (writers and/or editors), plus critiques from your fellow attendees. The $70 fee includes lunch on Friday, group sessions, and panels or presentations throughout the day about the craft and profession of writing as well as printing costs. You also recieve admission to all three days of the convention. You can purchase your entry to the workshop on the membership page. Ian McDonald, Ted Chiang, Nicky Drayden, Jacob Weisman, Mario Acevedo, Stina Leicht, Marshall Ryan Maresca and Skyler White. More to be added in the future. Deadline for Manuscript Submissions will be June 15, 2014. The ArmadilloCon Writers' Workshop has become a major event for aspiring SF/F writers. It meets before the convention on Friday morning at 9am and runs until about 4:30pm. Workshop curriculum is designed for beginning and intermediate students. Workshop participants are given the opportunity to have their work critiqued by major professional editors and/or writers. The workshop will cover craft, markets, the dos and don'ts of preparing your work for professional publication, and more. Discussions range from the basics of style to plot, theme, character, and setting. Within the breakout session, students receive an in-depth critique of their work from both instructors and peers. At the workshp, students receive a personal, in-depth critique of their work from instructors and peers, utilizing the Milford style. This roundtable style critique session is invaluable for learning what works, what doesn't, and how to edit your work. For further information, check out the webpage. A few months ago I witnessed something that is an uncommon occurrence in the States. I was waiting in our favorite local Thai restaurant for our take-out order to be ready, when a young woman walked in the door. This woman wasn't particularly remarkable: dressed in jeans and T-shirt, she looked like a fairly typical Asian-American college student. But upon seeing her, the woman behind the counter bowed to her. Almost immediately, one of the waiters did the same. They stayed bowed until she acknowledged: a polite, even friendly wave that let them know, yes, they could get back to what they were doing. Then she went on to join friends at a table. Now, being a writer, I immediately began to speculate on what I just witnessed. It could have been as mundane as a sign of respect for the boss's daughter, or as elaborate as her being a minor member of the Thai royal family. I had no clue. But what was clear was that this was an overt display of class distinction, where two people showed reverence for a member of the higher class, and that person showed acknowledgment of that reverence. Both sides followed the rules of what was expected of them upon meeting. We don't see that in the States much, partly because our class distinctions are fuzzy, fluid and ill-defined. As such, there are no hard-and-fast rules of protocol. But that's a quirk of our culture. Many cultures do have class distinctions where the lines are very strictly defined, as are the rules for interaction between classes. So, how do your characters show that, especially in a way that shows that both sides of the table have rules and expectations. Or, how do your characters subvert the expectations? I've made little secret of the fact that I'm a worldbuilding completist, though even I have a limit of what "completist"would actually mean. For example, in my Banshee setting, that meant having a strong sense of what was going on within 30ly of Earth, a solid framework of 100ly from Earth, and a rough sense of 150ly from Earth. In the world of Thorn of Dentonhill, I at least don't have to deal with the infinite vastness of space. One planet is a simple enough limitation, at least in terms of continents and oceans. 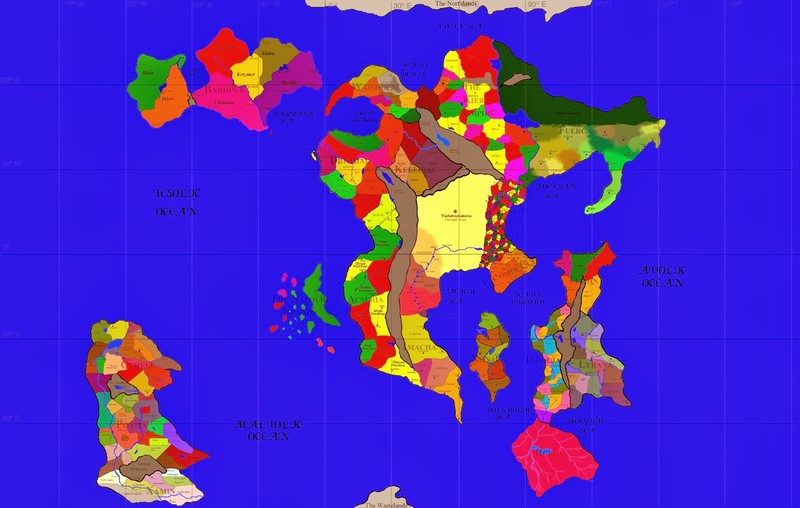 Draw out a world map, and you've defined the scope, and then place the cultures in them. On this level, I've worked out the general concepts behind each nation and culture, and on a map level, the breakdown of districts/provinces and cities. However, for a lot of the areas that aren't Druthal, that's the limit of what I've done. For example, while the history of Druthal is a 25,000 word document*, over in the eastern areas of Xonaca or the Tyzanian continent, I have just a bullet-point outline of the history. Can I delve into greater details there? If I need it. Right now, at the very least, I don't need that at all, and at a certain point that degree of worldbuilding is more distraction that purposeful. After all the stories I'm writing, at least right now, take place in Druthal, specifically in the city of Maradaine. Now, I've built Maradaine as a cosmopolitan city, a place where people from all over the nation, as well as the world as a whole, might end up. So it was important to have a sense of the whole country, and how the finer details could affect the city. This was especially true in the case of Way of the Shield, which deals with Maradaine as a capitol city. With Parliament members from Acora, Monim or Linjar, I need a strong sense of what being from those places mean. But even knowing all that, the thing I really needed to know was the city of Maradaine itself. Just as you wouldn't try to write a book about New York City without having a sense of what you were really saying when you mention Soho or the Upper West Side, I needed to know the city itself, and understand what it would mean to live in Aventil or Dentonhill or Seleth or High River. Every neighborhood has its own sense, and to a degree, its own minute history. 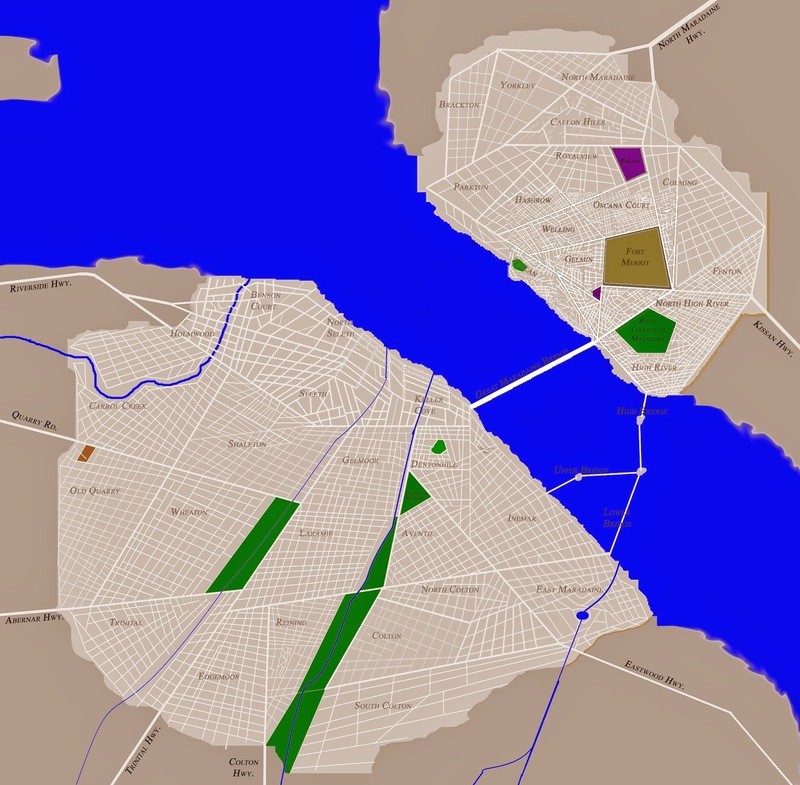 I wouldn't work out other major Druth cities like Fencal, Yoleanne or Lacanja with the same level of detail, because, again, I don't need that at this point in time. Maybe I will never need it. So, again, even for a worldbuilding completist, it would be more a waste of time a distraction from the writing itself. Now, of course, what I really needed to do-- what all stories need from the worldbuilding-- is how it works on a personal level. Some of this is micro-managing the geography, which is a level I personally felt I needed to do. 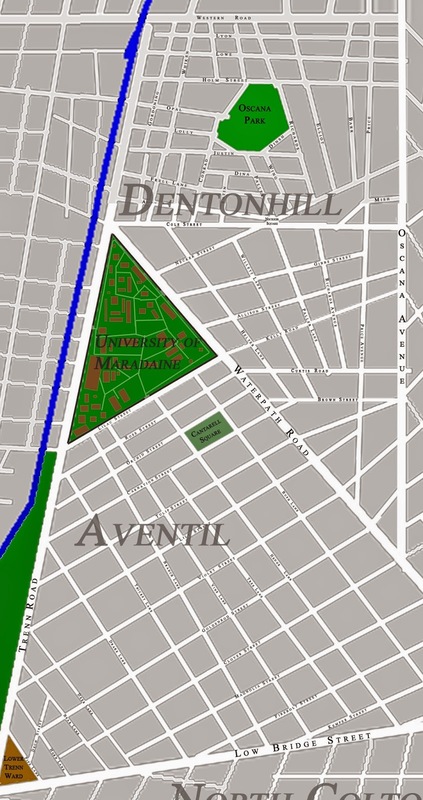 I have to admit, I've got a certain pet peeve in fantasy books where cities-- sprawling metropolises-- are little more than towns with no street names, and districts that are more on-the-nose descriptions than actual names. Honestly, when I see that sort of thing, it highlights that the writer simply didn't do their worldbuilding work, which makes me feel like the work as a whole is going to be sloppy. As I said, there are plenty of details that don't need to be done, but the ones closest to the story itself should feel full, vibrant and detailed. That way, the story you write in it feels like it's in a living place, rather than a vague template of a generic setting. Because, after all, who would be interested in reading about that? *- For my own sense of verisimilitude. In no way will the reading of Thorn or Murder of Mages make you feel like there will be a quiz at the end. So, earlier this week, the long running series How I Met Your Mother had its final episode. And, despite some excellent moments in there, its ending left me cold, and I was far from the only one to think so. It was, quite frankly, not the appropriate ending for the nine years they had built up. SPOILERS: Specifically, in the time frame where older Ted is telling his kids the story, the mother is already dead, and he's more or less telling them the whole story to put the idea in their head that maybe he should start dating again. More specifically, that he should date his on-again, off-again flame from before meeting their mother, who the kids know as Aunt Robin. The kids approve, and the last shot is Old Ted showing up at Old Robin's apartment, carrying a blue French horn in a direct callback to the very first episode. But here's the thing: this was the ending the writers had intended from early on. They had shot the scenes where the kids actively suggest and approve of Ted getting together with Robin way back in the beginning of the show, since they didn't know how long they would go, and the actors playing the kids were growing up. So, they had had this footage for eight years, and had always intended this as the ending. And you know what? If they had used it as an ending then, at the end one of the first couple seasons? It probably would have worked. But at this point, it wasn't right. The show had spent much time demonstrating how toxic Ted's affections for Robin were, how definitively their relationship didn't work, how much he needed to make a point of letting her go. They had developed, rather well, the romance and marriage of Robin and Barney. And biggest of all, they had Cristin Milioti join the cast in the last season as the titular mother. Milioti managed to pull of the high-wire balance act of making Tracy-- the mother's name, revealed in the penultimate moments of the show-- into a real and vivacious person that the audience cared about. All these things which made that ending, that old footage, completely inappropriate for the story they had built up. I've gotten rather long-winded here. As anyone who's been reading this blog for a while will attest, I'm an outliner. I'm big into making the Big Plan as part of the writing process. But even with that: you need to embrace when the story has, through the organic process of writing it, shifted in a different direction. Sometimes the worst choice you can make is to stick doggedly to an endgame plan that no longer fits your story. The big question is, how do you know if this is how you're doing? For me, the biggest sign is when I'm working and feel myself at odds with where I'm going and where I "need" things to be. This was part of my problem when writing Way of the Shield-- finding ways to fit what I had planned for the end sequence when that just was not working. "Kill your darlings", I was told in film school, and that still applies-- including throwing away the ending you've been sitting on for eight years when your story demands it be something else.